These instructions are now probably out of date. Thanks everyone for the discussion and the links. If you’re really interested in this, you should probably check out the android-porting google group / mailing list. Now that you’ve read the warnings, I’ll point out that I’ve posted an installation image below. If you want to roll your own, continue from here. Get the source by following these instructions. BIOS Settings – Go into the BIOS settings (press F2 on boot) and set the boot device order so that the hard drive comes first. Also under IDE configuration set the internal flash drive to load before any USB drives. ADDED 2008-12-21 – You must also turn off the SD card reader for the installation procedure. Boot – Plug the usb stick into your Eee PC and boot from it. When the BIOS screen comes up, press the ‘Esc’ key to get the boot menu. Select the USB drive. You should be presented with a rudimentary installer menu. Quickly press an arrow and select option 0 (sysloader), then press Enter. Let the install run – When it’s done type “reboot” and hit enter. Once it reboots, wait a few seconds and then the android boot screen will appear. Tada! Note that wifi and many other things don’t work right now, so I’m trying to figure them out. I’ll post the installation image shortly, and more details here as I find them. These instructions are mostly based on information found here. Image for your consumption is here (mirror) (torrent). (Please use the torrent if you can). This is governed by the Apache 2.0 and GNU GPL Licenses. The sources are currently available from Google. Please write “source for Android EeePC build ” in the memo line of your payment. I’m currently uploading your img file and in the same time, I finish the setup of a mac OS compilation environment. I’ll post the result here. I had no success in booting the img provided. After trying another time from my ubuntu machine, I gave up with the img file. In the meantime, I just need a last step to compile by myself. Titimoby: I’ve double-checked that the file on the server and the file I used for installation are the same. The md5sum is 48953dc4371284b7d4e0ed4a6f7ffa21. Is it not booting at all, or not installing? Do you see any error messages? I just checked my file is ok. When I dd to my usb stick, the files and folders have names with special characters. The thing doesn’t boot at all, but the strange file names made me think i messed the dd operation. - maybe a BS parameter is needed for the dd command. Did anybody try this on virtualbox or vmware player running on XP? Is it possible to run this build in virtual environment? sg: You should be able to build for a generic x86 machine without the eee_701 target. Brock, did you get WiFi working yet? Can you build a kernel from scratch yet? How would suggest this to be installed on somthing such as VMware? Mount in Deamon tools then install? Mike Miner, you’d have to make sure that the partition layout matches that of the Eee PC. You should then be able to specify the boot image as the second hard drive. I haven’t tried this, but I may give it a shot in VirtualBox soon, since reinstalling over and over on the Eee gets kind of annoying when trying things out. Jim Thompson, I haven’t got wifi or a kernel from scratch working yet. I need to spend a little time tweaking the kernel config, and I’ve been away from my Eee PC and my main building workstation on holiday break. I’ve tried booting it as a floppy image in VMware, it complains about the partition table being corrupt. Ill get back to you if I get it working. FWIW I’m not a Google developer, regarding comment #13. I could boot the image on VMWare after converting it using qemu-img and using it as a SCSI harddrive. But it hangs after some time, “Waiting for the device: /dev/block/sdb2″. My VMWare config has 2 SCSI HDs, a 8GB empty image as SCSI 0:0 and the Android image as SCSI 0:1. Using a IDE HD (for the 8GB disk, VMWare don’t give any option for the Android image) doesn’t change anything…. In “/dev/block” only sda is listed. Hi Brock, could you pls post the instructions for virtualbox if u were able to run this build on it? I was able to install it in Virtualbox but it doesn’t boot all the way. It boots up to a certain point and i see a blank screen after that.. I enabled VESA and IDE in kernel config file. Not sure if anything else is missing. Felipe, did u see this link. It has instructions on VMware. Wow many thanks for your great work!!! Hope really, that you include Wifi,Touchpad,SD Card,and that i can install apk’s. Then my Dreams come true. It was my first real android experience,far away from slow sdk emu,thx again! I got the image to boot on VirtualBox, but it hangs when trying to write system.img to /dev/block/sda6 for some reason. I had to edit the GRUB configuration to point to (hd1,0) instead of (hd0,0). I see this was also mentioned in the discussion linked by sg. I thought it might be a bug with the sparse disk image I had used, but using a pre-allocated disk image in VirtualBox didn’t help. I don’t know what I have done wrong…. I searched on android dev forum but no answer on that kind of topic. the first error came from the xml file. You know, redistributing a binary without providing the source *yourself*, is a violation of the GPL. Of course, no one is going to call you on that technicality but I just thought I”d mention it. Darn the luck. I am using a mac. Also I tried downloading the img file but when I try to mount it on my mac it fails thus I don’t know how to put it on a flash drive. The main (only?) GPLed component is the kernel, and I actually used the prebuilt one in the Git repository. I looked briefly into how to get the source for that version of the kernel from the Android repository so that I could compile the madwifi drivers, but didn’t find them. I do intend to post the source once I figure that out. I know very little about Git, so I’ll have to learn a bit more first. Clearly someone has called me on it — you. I was aware of the problem, but considering that I made no modifications, I didn’t think anyone would be pedantic enough to care. But then, I didn’t expect Slashdot-level exposure either. Thom, don’t mount it. Just use dd on the command line. You’ll have to figure out which device is the flash drive using disk utility, and then probably use sudo to run dd. Brock please delete my post 26 the dd command is backwards and this is the correct one. For those mac users. I got my usb flash drive to write. Now comes the other problem. I don’t have an eeepc. I have the acer aspire one. I hoped they had real similar hardware and would work. I put in my flash drive and started the machine. All I got was a flashing cursor on the top left. Nothing more. The aspire one doesn’t have an option to disable the card reader. Any thoughts or was it a pipe dream to think it was going to work? Thom, I’m sure you mean if=(…)/eeeDroid_…img of=/dev/disk1s1. I’m not sure what is different with the aspire one. As Dima (the google developer in the linked discussion) mentioned, the installer is quite fragile. That’s probably the first thing the enthusiast community will want to improve. I have some other higher-priority stuff going on, but eventually I’d like to take a look at modifying the installation script. Haha, deleting post 26… We must have been writing at the same time. I was able to install the image in virtualbox (i got past the/dev/block/sda6 problem by following the link i posted earlier). It boots up to a certain point after installation and shows a blank screen. I see the same problem with the image i built(i did enable VESA and IDE in kernel config). hello all, I’ve downloaded the provided img dd’d it to a usb flash device factory formatted from an ubuntu machine and went I reboot I just get a grub message appear in the top right hand corner of the screen with a flashing _ (underscore) and it doesn’t go anywhere from there. Has anyone else experience the same thing? If so, what am I doing wrong, I’ve tried several times to dd it to the usb stick as well as a SD card but too no avail, should you dd if the volume is mounted or unmount I tried both ways and nothing, any help would be greatly appreicated, thanks, Martin. Okay, I finally managed to do it, I had download the file again as it seemed not to download correctly, I have managed to load it up on my MSI Wind, if someone can give me some advice on have to tweak the kernel for different hardware – specifically wifi, I have a wifi card in there from an original intel mac mini the core core duo not the core2duo. Any hints or advice would be greatly appreciated, thanks. Richard. The flashing cursor is on the boot of the machine with the flash drive in the mini not during the dd command. Thom, does your flashing cursor say grub to the right of it? I’m very curious about this as well. I’d like to be able to install on the eee, but I’m hesitant to do so without wifi support, seeing as that was the reason for getting it in the first place. CatWithNoName » Blog Archive » I want a spare Eee now, and a helicopter. Andrew, make sure when you dd the image to a usb drive that you dd to the actual drive and not a partition of that drive. for example say you have a usb drive under linux in /dev/sdb1 – the 1 in that indicates at partion of that drive so dd it to just /dev/sdb without a number after it and it should sort your problem out. Thanks, Martin. Well, I’m on a mac, so would it be /dev/disk1 instead of /dev/disk1s1? Andrew, I guess it works the same like that on a mac, I have and do use a mac but not for anything remotely unix related so can say for definate, give it a try, it can’t hurt just make sure you’ve got the correct drive, type df from a terminal and make sure, you don’t want to wipe out your hard drive or something else! Martin. Richard Stallman used to request $100 for copies of the source for emacs. You may want to follow in his footsteps for those who are overly pedantic. Thanks for the IMG, it worked perfectly. I’ve installed it on my eee 701. I noticed there’s no mouse support and everything is done through the keyboard. Any idea on how to get to a terminal? Answered my own question, ctrl + alt + F1 just like any sane linux distro. No idea what the search key is. Chris: Yep, and the windows menu button = menu. Also, the brightness keys seem to work, but none of the rest do. Also, the menu button = menu. How convenient. What is the status on WIFI? Until I can get a kernel build, or get the build tree of the prebuilt kernel, I can’t get wifi working. Apparently the GUI is also not prepared to load differently-named wifi modules, although that could certainly be hacked. I downloaded your IMG file and used “dd” to copy it to my USB thumbdrive, but somehow it’s not working. Then there is some more [sdc] stuff, and in the bottom line I can type commands. Don’t know what to do, when I enter “reboot” it reboots and no change it made to my SDDs (WinXP and Win7 are still there). Please check the directions in this post — you need to turn off your SD card reader in the BIOS, and set your boot order appropriately. SD card reader is turned off, and I think the other things are configured correctly as well. Hm, that’s not what mine looks like. Is this an Eee 701? No, I’ve got the Eee PC 900.
multimolti, I’m having the same issue on my eee 900. Keep me posted if you get it to work, I really don’t know what I’m doing. Nobody knows a solution? I would really like to try it!! @Brock – Does 2.6.28 give us wifi out of the box then? Does anyoe tryied putting this into a SD card instead of the internal SDD of the eeePC unit? If possible, I could give a try. I do not want to void my ubuntu installation. I’m not sure. I’m not really an expert, and I haven’t been messing around with this lately. I suggest you (and others) join and post to the android-porting google group, where much more knowledgeable people than I can answer your question. Good luck! I did the dd if=out/target/product/eee_701/installer.img of=/dev/ stuff to create my bootable thumbdrive, but its not working (see comments above). Now I want to use my 4GB stick as usual, but Windows XP detects it only as 4,35MB stick. I formatted it 3 times, no help, I think the hidden partition takes it all. How can I get my 4GB back? Please help!!! multi you may have a partition map still on there. try dd if=/dev/zero of=/dev/’yourdevice’ to zero it out and then repartition in the OS your wanting to use it in. I fallow the steps to build image, and the image is generated successfully and workable thanks. But I has a question, When I boot the eeepc by your image, the api_demos and dev_tools are included to the menu, and I can run the application, such as terminal emulator, but if I boot eeepc by myself image, the api_demos and dev_tools do no exsit, is there any motification of Makefile, generic.mk, or other files ? I didn’t do anything special. The build process may have changed since I wrote this. Could you provide the kernel config? I use the kernel config in vendor/asus/eee_701 to re-compile kernel and it fail. I used the pre-built kernel, which is supposedly compiled with the config file in that directory. However, the kernel source in the tree is not of the same version. If you want to use that config, try getting the same kernel version from the Android tree. I think it’s 2.6.25? multimolti, delete all partions on the USB stick using Linux, either gParted or cfdisk. Then format it in fat32 with either one of those tools, and then use windows to do a full format on it using device defaults options in the format window. I hope this helps. Thanks for the tip but I did it already using Windows XP. If you go to the partition manager, you will see every partition and can delete them, then format the USB stick again with FAT32. multimolti, okay, not a problem, glad you sorted it out. Realy cool, wonder what I’m going to use it for? What about an Android Live-CD??? Can you guys do it? And I have check my USB stick. The cmdline, kernel, ramdisk are be in sdb1, and boot.img, bootdr.bin, system.img, userdata.img are be in sdb2. Maybe Someone can give me some suggestion to boot android in my eeepc 901. Did somebody get the .img work?????? on a linux machine with dd? Psirus: Several people. Did you check the MD5? Are you using my image or did you build your own? Did you turn off the SD-card reader in Bios? It doesn’t install unless you do this. Anyone got it to work on Acer Aspire One Netbook? Then it gives me a shell. Same here! 1) Only sda1-8 are listed so the internal drive is not being detected. 2)I still dont know how to mount the second partition to /data. I wish someone could make a updated image with version 1.5 that was just release. Anyone? Looks like there’s been some progress recently (e.g. wifi and lan are working). And nothing else. If I press return, I have the command-line and can type in “reboot”. I don’t know it those are hints of what’s going wrong. I also have to tell you my comp is an asus eeePc 701 first gen (2gb sdd) with 2gb of RAM, actually running eeeBuntu 2. Thanks again if you can help me. I’m looking at porting this to my Lenovo Ideapad S10e, and was wondering what I would need to change in the xml file, and the build instructions to do this? Hey, i have been reading up on android running on netbooks, and the couple of “DIY” posts i have seen have been for the eee pc. Is there any reason why? because i would LOVE to have this running on my Acer Aspire One. Is this possible? If so anyone got any ideas on how to do it? I cannot make because of my java-version. It’s openjdk6 on archlinux. I cannot rollback to 5 because there’s no such version. Anything I can do? Jan, Unfortunately these instructions are well out of date. OK. Thanks for your answer. Hello! I didn’t use Android, but I want to test it. 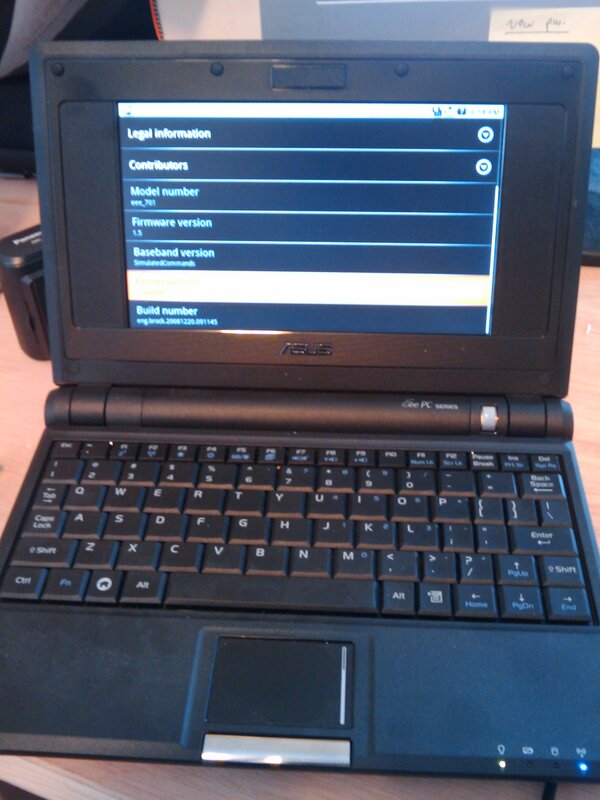 I have Android build on my Eee 701, but Wi-Fi and Ethernet aren’t work, but in manual was written that it works. Will Wi-Fi and Ethernet work by following this manual? Hi, thanks for your comment. This howto is very much out of date, I suggest you check the Android Porting mailing list: http://groups.google.com/group/android-porting . This is the blog of Brock M. Tice. For more information, including contact information, see BrockTice.com.